It was dark, the streetlights were still on from the night before and the only people I saw on the street were my video production crew. It was 6:00am and we were headed to Philadelphia from Manhattan to shoot a marketing video for Atrium Health and Senior Living. Our production crew consisted of our director, dp, ac, gaffer team, gimble operator, grip team, wardrobe and make-up team, ad, production assistants, and a team of creatives from the advertising agency. This is not including a cast of almost 20 people. To say we needed to stay organized was an understatement. We had 12 scenes to shoot and multiple set ups within each scene. LET’S BEGIN THE ONE PROJECT YOU WILL NEVER FORGET! The team got moving. We had only one day to shoot the entire marketing video. Our first scene was a setup outside of the entrance of the Atrium Health and Senior Living location in Woodbury, New Jersey. We wanted to open the marketing video by showing a man dropping off his wife for recovery after hip surgery. The scene was shot using a Canon c300ii on a dana dolly. The dolly was to provide movement to the shot. This scene was a relatively quick set up but we needed to get the lighting just right, as we were shooting outdoors with the help (or hindrance) of the sun. Our next few scenes were relatively simple to set up. We had a shot of our main character walking down a hallway and then walking passed a salon, waiving hi to the people getting their nails done. There were multiple angles to shoot from that we had to take into consideration when lighting both scenes. The following scene we shot was complicated and took a while to set up. Our film crew was responsible for shooting a woman on an underwater treadmill. This took some finessing to get just the correct angles and set ups for lighting. The team came through and this is one of the highlighted scenes in the overall piece. After the underwater treadmill scene, there was a scheduled lunch break for cast and crew. Some of our production crew had to eat quickly because our lighting and camera set ups had to be set on schedule for the next scene. We have to be thinking a scene or two ahead or else there is no way we would be able to film as many scenes as were on our schedule. The next two scenes took place in the bistro and the pub. We had a two-person lunch scene in the bistro while we shot a family birthday scene in the pub. When we scouted these scenes, we had a pretty good idea of how we wanted to set up camera and lights. Our production crew executed flawlessly.The next scene was really fun to shoot. 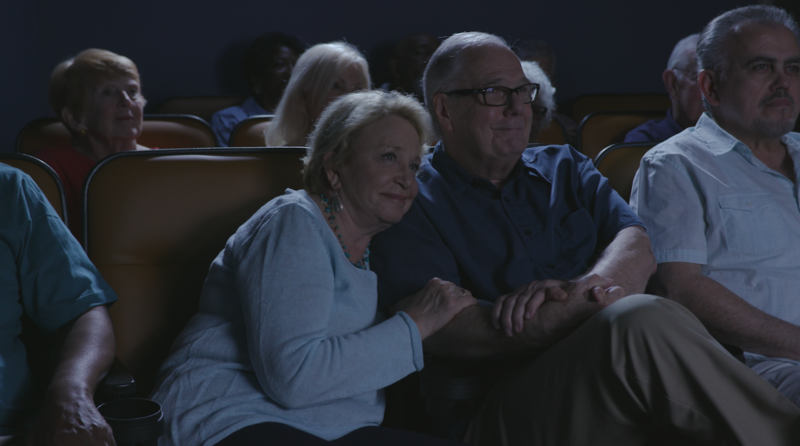 The Atrium Health Senior Living Facility has its own movie theater and we wanted to highlight that as a part of our marketing video. We had our main character in the front row with an actor playing her husband along with ten extras to fill up the seats. To cheat the glow from the movie screen, we used a bounce board with our Kino Joker 400 to create the illusion that our characters were watching a movie. The end result looked very realistic. Our next two scenes were two of the most challenging of the day.